Brushing a wisp of gray hair our of her eyes, Leah glanced across the room or Mary. The ceremonies had continued for several days now, and Leah thought all had gone rather well. Mary sat alone in a place of honor. Her long, uncombed hair nearly hid her face as she bent forward in silent grief. Leah knew how much Mary's brother, Lazarus, had meant to her, and Leah, too, had mourned the dead, so she knew the pain Mary suffered. This Man Jesus hadn't helped matters any. The furrows of age and sun and wind on Leah's bronzed face deepened as she frowned. Mary and Martha had sent a messenger boy to Jesus at the very onset of Lazarus' illness. Leah herself had schooled the little boy from the village until he had the message word-perfect. "Lord, the one you love is sick." "Very good, small one. Now hurry to Jesus," she commanded, giving him a motherly pat on the bottom to help him on his way. And the message that returned gave hope to the two sisters of Lazarus. "This sickness will not end in death. It is for God's glory so that God's Son will be glorified through it." But Lazarus had grown sicker, the fever eating away at him. Four days ago he had become very still. Then his face paled, and his eyes closed for the last time. Jesus had given the sisters false hope, and He hadn't even bothered to come! Leah clenched her teeth angrily at the affront. As far as she was concerned, Jesus was a fake. He did nor merit the attention crowds of searchers lavished upon Him. A movement at the door drew her attention. Martha, who had slipped out several minutes earlier, had just returned. She moved quietly but purposefully. The look on her face perplexed Leah. Martha went straight to Mary's side, bent over, and whispered in her ear. Leah saw Mary's body go rigid, then consciously relax Mary nodded, and the two sisters rose and left. They moved so quietly and unobtrusively that Leah alone seemed aware they'd gone. Thinking that they had gone to mourn at the tomb, Leah set about organizing the rest of the patty to follow in orderly fashion. Leading the procession of mourners, Leah halted in surprise when she came upon Mary and Martha just a short distance from home. In a quiet garden of grape arbors and flowers the two sisters stood among a company of rough-looking men. And on a boulder jutting from the ground sat Jesus of Nazareth! Leah stopped so suddenly that the mourners directly behind bumped into her. It took a few moments to settle the confusion that resulted. Leah seethed with embarrassment and anger. This young impostor! How dare He show His face after all He'd done--or not done! No wonder He had not come to the house of mourning. He had no place there. He shouldn't even have come to the garden! Speaking the words that burned in Leah's mind, Mary said, "Lord, if You had been here, my brother would not have died." Mary should have been more stern in her tone, Leah mused, but the statement clearly rebuked this young Teacher's lack of compassion. Jesus looked at Martha for a brief moment, some silent understanding passing between them. Then he turned toward Mary and brushed away a single tear that cut coldly down her cheek. Leah noticed how the tear glittered on Jesus' finger in the sunlight, like a signet ring on the finger of a prince. "Where have you laid him?" Jesus asked. "Come and see, Lord," one of the mourners broke in. Then before Leah could regain control of the situation, the band of mourners hurried off, joined by Jesus' followers, the two sisters, and Jesus Himself. Infuriated by the disregard for traditional etiquette, Leah followed the knots of people, but she held herself aloof in disdain. At the tomb the crowd respectfully stood aside. Mary, Martha, and Jesus took up positions nearest the tomb. Leah slipped into the trailing edge of the crowd and elbowed her way to a place where she could see better. Jesus gazed around at the people, searching their faces with a troubled look in His eyes. The area of the tomb remained silent with death. Even grass had difficulty surviving there. A whisper in the crowd drew Leah's attention to the tears that streamed down Jesus' face and into His beard. "See how He loved him!" breathed someone nearby. "If He opened the eyes of a blind man, couldn't He have kept this man from dying?" Leah observed cynically. The murmurs of assent that greeted her statement pleased her. But Jesus stunned them all seconds later. "Take away the stone," He commanded. "But, Lord," Martha interjected, "he's been dead for four days! His body has started to decompose!" Leah could not believe Jesus' gross disregard not only for tradition but also for common human decency. After all that the sisters had gone through, He now intended to cause them further pain and humiliation by exposing their brother's remains! Leah nearly turned away, but she realized that the leaders of the village would want an accurate account of the atrocity. She decided to stay, muttering vehemently to herself. "Didn't I tell you," Jesus answered Martha calmly, "that if you believed, you would see the glory of God?" Martha thought for a moment then motioned to two burly men among the crowd. Without a word they rolled back the tomb's covering stone. In the day's heat the stench spread rapidly. Several people among the crowd covered their mouths and noses with folds of their garments. Then Jesus began to pray--not swaying back and forth or in a singsong chant like the priests, but standing still, face upward, eyes open and hands upraised. "Father, I thank You that You have heard Me. I know that You always hear Me, but I say this for the benefit of the people standing here, that they may believe You sent Me." 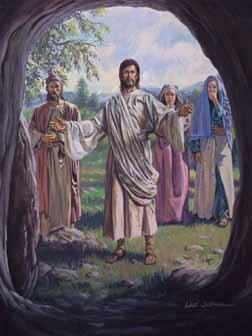 Turning to face the gaping black maw of the tomb, Jesus cried out in a voice that seemed to shake the ground, "Lazarus! Come out!" The people in the crowd who had found Jesus' manner offensive suddenly gawked as a hand wrapped in the cloth of a shroud grasped the opening of the tomb. A figure muffled by graveclothes stood in the light of the sun. "Take off the graveclothes and let him go," Jesus ordered quietly. A thoughtful smile played about His face. His words broke the awed silence of the scene, and half a dozen people rushed to free Lazarus of his fetters: Mary and Martha clutched at him tearfully, calling out his name again and again. Lazarus stood mute amid the crush, unable to take it all in, not yet understanding what had happened. When Leah looked for Jesus, she discovered that He had vanished in the clamor and confusion. Her mind raced as she began to perceive that Jesus was far more than she had ever supposed. Conflicting emotions swirled through her. The words she'd said haunted her. But she knew one thing for certain. He must be the Messiah. Leah hurried away from the tomb and ran toward Bethany. She wanted to be the first to break the astounding news to the village rabbi. The leaders of the Jewish nation had to know that at last the Messiah had come.